others charge over $55 for identical item! The NeuroQuinti Five-in-One is a Buck-type reflex hammer, a Tuning Fork (Choose C-256 or C-128 Hz ) hand tuned and ends rounded, a neuro-pinwheel, a brush, and a pin in ONE TOOL. Made in USA, it cannot rust. 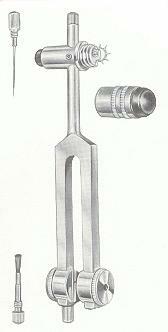 The C-256 weighted fork is used for hearing AND vibration testing, it is 21 cm in length, weighs 113.4 gm. The C-128 weighted fork is used for vibration testing only, it is 25 cm in length, weighs 141.7 gm.